I taught in rural areas of Virginia throughout my teaching career- in places where farms and cows dot the landscape; in places where kids might have intense interests in tractors, cows, or horses. 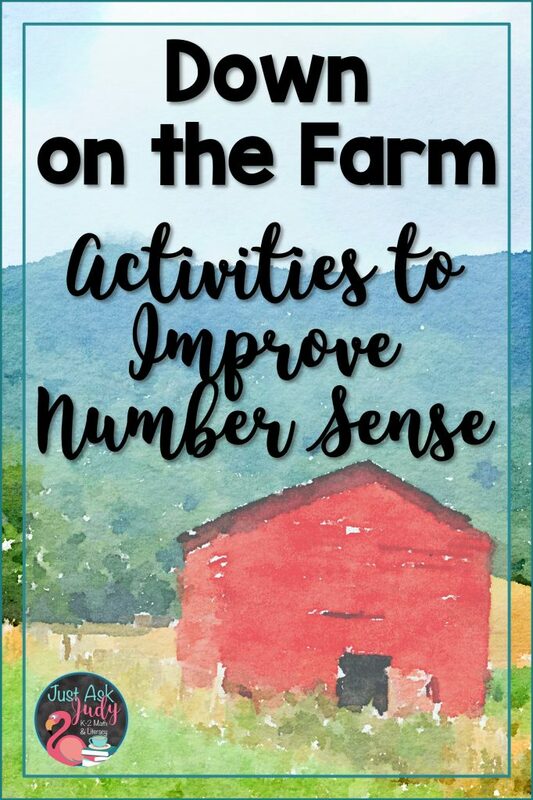 Whether you live in the city and are teaching a unit about farms or you live in the country and you’re catering to your kids’ interests, I’ve crafted some farm themed number recognition and number sense resources for you, including a freebie, to meet the needs of your pre-kindergarten, kindergarten, and early first grade students. Your students with a solid sense of number will easily understand the concepts of one less and one more than a number with minimal instruction on your part. Other students would benefit from the opportunity to develop a solid understanding through the use of concrete manipulatives. 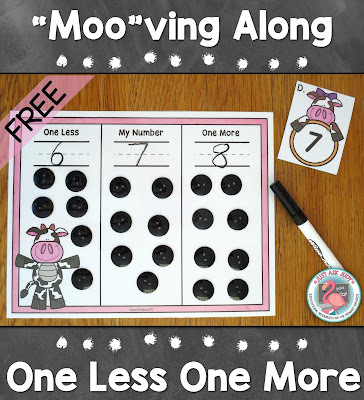 This flexible One Less One More cow themed freebie can easily be used with both groups and everyone in between. I created two sets of nine number cards, 1 to 9 and 11 to 19, in color and black/ white, along with a mat, in color and black/ gray/ white, for showing quantities with counters. I also included a recording sheet. Use the mat with counters for teaching the concepts of one less and one more or for providing support, as needed. I used black buttons to enhance the theme and color scheme, but any small counter can be used. Students pick a number card; then use counters to show the quantity in the middle column of the mat. They can use additional counters to show one less and one more than the given quantity in the appropriate columns. They can also slide the counters from the middle column to the one less column and remove one counter to show one less or slide to the one more column and add one counter to show one more. Space has been provided to write the corresponding numbers at the top of each column. You can emphasize that the numbers are in counting order. Students who understand the concept can simply pick a number card, match the letter on the card to their recording sheets, write the number picked in the middle column, and then write the numbers that are one less and one more than the given number the appropriate columns. 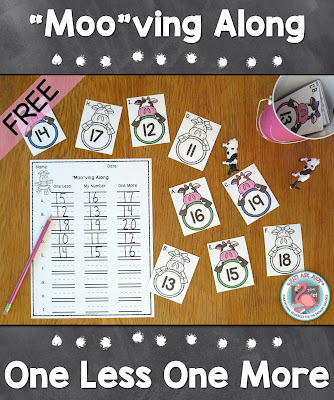 The cow number cards can be placed in a decorative container. 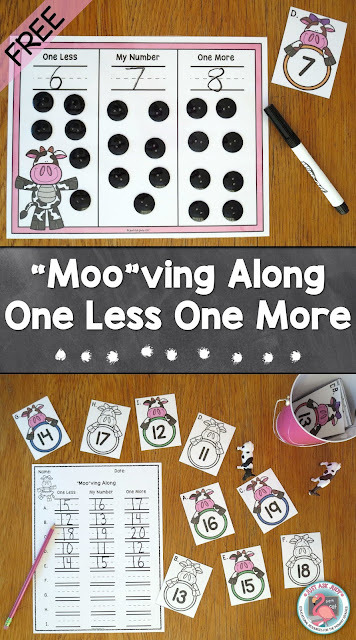 You can download this freebie, “Moo”ving Along One Less One More, from my Teachers Pay Teachers store. 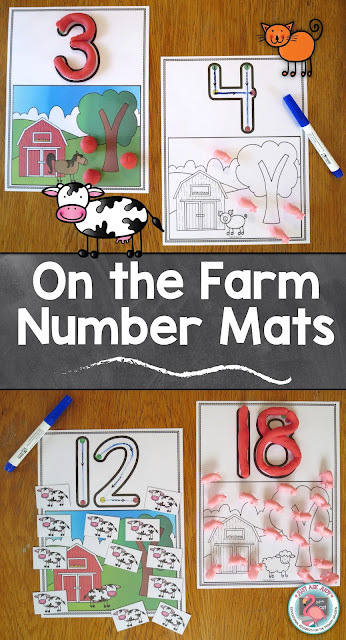 Sticking with the farm theme, you can also purchase these farm-themed number mats for 0-20 in my TpT store, perfect for practicing number recognition, number formation, counting, and cardinality. 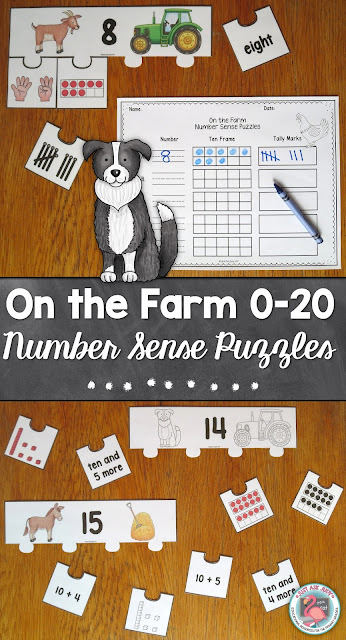 These number sense puzzles for 0-20 with a farm theme are ideal for an independent math station. Be sure to click on the links below to explore more farm-themed ideas and resources. Check out this Pinterest board for even more ideas and resources!